When autumn came, I was harvesting rice with the sickle in the hand work in the cultivation of rice farmer in childhood. And, the bunch of the rice plant was multiplied by the gobioid, it dried naturally, and the threshing work was done with the thresher. Kerosene was needed by using the dryer for dry work of the paddy this time though it became very convenient. It came to borrow the power of the machine and the energy of oil in doing anything. The farmer should master those machines well now. I want to write it as how to use combine from my experience about the instructions this time. This photograph is a combine that I am using. It is a manufacturer and the model is CA85 of Yanmar. After it obtains it in the Middle Ages, this has already been used for about ten years. The breakdown is hardly found. I think that it is a quite good product. A left photograph is taking of threshing part and straw cutting part as seen apart. The part that is not reflected in the photograph in this left part is a reaping part. The trunk for threshing is seen in the center part. The chain that sends the rice plant straw to the threshing part and the straw switching off part under that is seen. 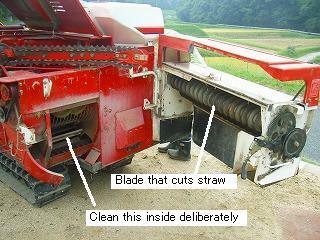 There is a blade that cuts straw in a right edge. A right photograph is seeing of the combine from the back. There is a part where the garbage that is seen from the back and threshed under the left is exhausted. Because it might block in this with garbage, the check cleaning is sometimes necessary. The cover is taken in this photograph. A left photograph sees the reaping part and the driver's seat of the combine. 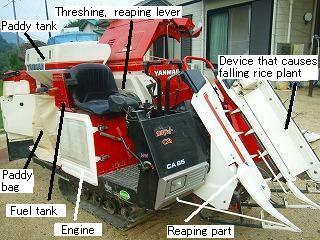 The device that causes the rice plant that falls in the left of the reaping part is put up. The rice plant that falls completely is caused well as long as stock origin stands very much in the excellent one, too and this is reaped. Right photographs are various operation levers seen from the driver's seat. Driving, reaping the rice plant, and threshing are done by operating these. 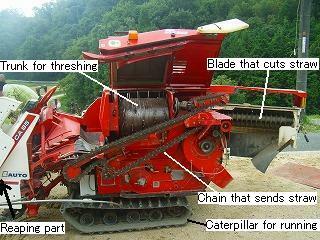 It is checked whether each part is seen before the engine of the combine is started and abnormality exists. It checks for neither crack nor the crack, and when it is bad, it exchanges it. Grease is injected into the part where grease in the Caterpillar part etc. is injected with the grease pump. It checks, and it replenishes it with cooling water for a water-cooled engine. The fan and the filter are cleaned, and checked for an air-cooled engine. Install for each about 10 pieces paddy bags at the appointed position (two places). The parking lever is adjusted to the position of parking. Threshing and the reaping lever are adjusted to the position of the stop. It makes it to the position in the state to open the throttle lever from low speed-low speed a little. It puts it into the state of declutching stepping on the clutch pedal. The switch of the engine key is adjusted to the position of the start and the starter is turned. Compression is multiplied by the engine pushing decompressor bar and the engine is started. The how to stop of the engine adjusts the engine key to the position of cutting. Because the engine doesn't stop, the throttle lever is adjusted from the lowest to a low-speed side further and this is stopped. The parking lever is adjusted to the position of running with stepping on the clutch pedal. The high-speed, low-speed switch lever is adjusted to a high-speed (low speed) position. The gearshift (mission lever) is adjusted to the position of hope (1-6 velocities). The throttle lever is moderately pulled and the rotation of the engine is raised. The clutch pedal is quietly separated and it runs. 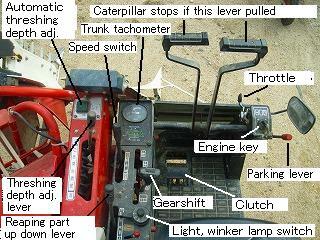 When right (left) turning by advancement, the lever that stops Caterpillar right (left) is pulled. Threshing and the reaping lever are put in threshing. It becomes a prescribed rotation while watching the rotation of the engine and watching the trunk tachometer. Threshing and the reaping lever are adjusted to the position of reaping. A cutting part upper and lower lever is knocked down to previous, and the cutting part is lowered. The gearshift is made a speed (one-four-speed level) at which it works easily. The clutch pedal is separated and the rice plant is reaped. Automatic [koki] [fuka] does and automates the adjustment switch or adjusts the position of the ear tip that hits the trunk in a deep depth adjustment lever. Because the buzzer rings when becoming full, the paddy stops reaping and exchanges the bag for the bag. It is set that straw is not cut and exhausts it behind when straw in the state of longing is necessary. Clothes wear long-sleeved shirts and long trousers, and shoes put on the gum boot. The hat and gloves are worn without fail. The purpose of this is to protect the body and it is very important. So as not to breathe in dust, the mask is done if necessary. The combine works safely taking care not others' entering for near as working. When a rice plant wet because of rain and dew is cut or the rice field where a lot of grasses exist is harvested, the net to which the paddy under the trunk drops might be stopped up. The paddy is exhausted with garbage if it doesn't sometimes check at such time. I want to take care not to throw away the rice grown with great pains especially. Especially, when there are a lot of blue grasses, the reaping part is raised a little up so as not to reap this and it cuts from the root of the stock of the rice plant on a little. When the combine kept for one year is used, the rat might be blocked of the inside as the nest is built in the combine. Let's often check before it uses it. It is always taken care that the rotation of the trunk doesn't fall while driving. When the rotation of the trunk falls, the paddy might not be blocked, and garbage be exhausted well. Let's sometimes observe the state of the paddy in the bag while driving. The trouble part might be understood from the amount of the garbage that mixes with the increase and decrease and the paddy of how of the number of paddies to increase. When storing it without using the combine for a long term, the fuel in the diesel fuel tank is made full. Otherwise, might do the be dewy of moisture in air in the fuel tank in the temperature change and water collect in the fuel tank. The battery is removed and kept in the cool dark place. It compensates and [mitsuru] is done about once every 3-6 months. In addition, each part is checked, and a place noticed while using it and a wrong place are not limited for this year and repaired for next year.